You will certainly turn heads when you use this Broken Doll Make-up Kit. 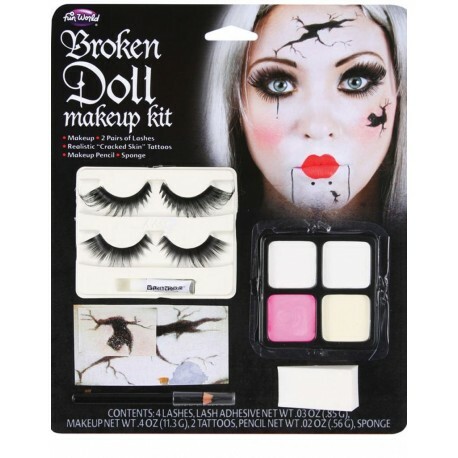 Included in this creepy halloween kit are two sets of eyelashes and four color make-up pod. From white to pink, you will have all the colors you need to create the perfect porcelain doll look. Make-up sponge is included in the kit for easy application. Make-up pencil ensures you have those extra doll details. Use this pencil to create a bottom jaw or tear drops for the flawless doll face. Also included are the “cracked skin” tattoos.